You will swear with delight – even if it craps on your favorite shirt! 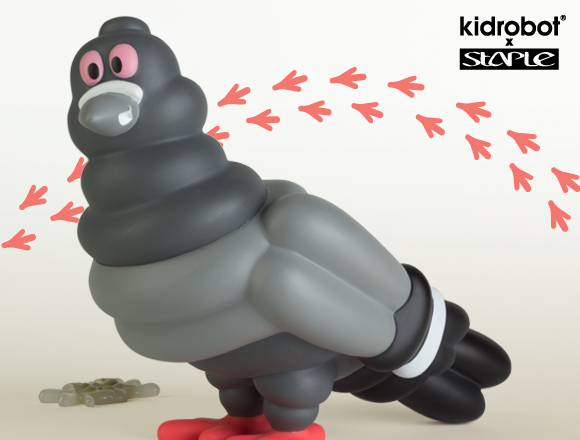 Grey and gritty, the Staple Pigeon is the first ever Kidrobot x Staple Design toy collaboration. A stylized version of the firm’s logo, this dirty bird is inspired by the grey rock pigeons surrounding Staple Design’s NYC headquarters – trust us, these feral fowl are EVERYWHERE. Luckily, the 7-inch vinyl version is smooth sanitized plastic and limited to only 800 worldwide. In shades of grey with color accents at the eyes and feet, this Pigeon is puffed up to impress. Looking fresh at Kidrobot stores, kidrobot.com and select retailers, the Staple Design Pigeon releases November 3 for $75.00 (£60 UK; 69.60€ Europe).